I just did the math, and I’m impressed. 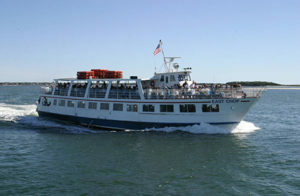 Hy-Line is starting their 49th year of ferry service to Martha’s Vineyard on May 4th! In 1970, the Scudder Family contracted to build a boat to run seasonally to the island of Martha’s Vineyard. In 1971, the M/V East Chop (named after a lighthouse on the Vineyard) was launched Maybe we should have a big party next year. I love a good party. Bringing you up to speed, we now start Martha’s Vineyard service with Lady Martha (see above). East Chop is now a vessel of our past. With the transition into providing all high-speed service to the islands, we changed along with our customers and their needs. Folks want to reach their destination fast, to make the most out of their day. Again this year, we kickoff our Martha’s Vineyard season with a day trip special! It includes an adult round-trip ferry ticket and a $25 restaurant gift certificate to either Coop DeVille or the Martha’s Vineyard Chowder Company. This $69 special is available May 4th through June 21, with the exception of Memorial Day Weekend. Step off our ferry and walk up the dock to the Coop DeVille. Coop DeVille offers casual outdoor seating and well-prepared New England seafood. 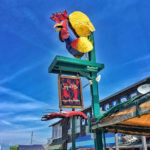 Enjoy steamers, boiled lobster, fried clams, and 8 flavors of Buffalo chicken wings (I know, I could hardly believe it too). It’s the perfect first place to stop, have a cold one, and plan your day! The Martha’s Vineyard Chowder Company is only a few minutes away, on Oak Bluffs Avenue across from the Flying Horses Carousel. 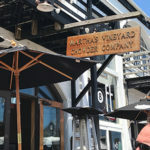 The Martha’s Vineyard Chowder Company is voted Best Chowder in New England by Yankee Magazine, Best New Restaurant by Boston Magazine and Best Chowder by Cape Cod Life, Martha’s Vineyard Magazine, and a Patch.com reader’s poll. Stop by and find out why! I know what you’re thinking. Why would I want to go so early in the season? There’s no good reason to go, nothing going on…. oh, my friend, that isn’t true. Flying Horses Carousel, the nation’s oldest platform carousel, is open! And let’s face it, it’s a great opportunity to celebrate Mother’s Day and Father’s Day! Events plus the fact that businesses are open and the crowds aren’t there yet, makes the perfect opportunity to visit the island for the day and have lunch or dinner included! For reservations, please book in advance by calling (800) 492-8082.